Officially licensed Fine Art with Warner Bros. 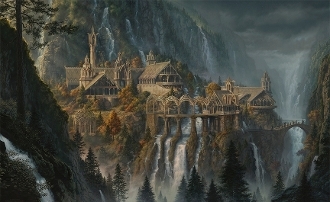 Studio, this is the first in a series of various landscapes throughout the realm of Middle Earth. This Fine Art Canvas Giclee measures, 24.25 x 35.75 inches. Facing canvas art measures either 19.5 x 31 inches. The Epic size canvas is no longer available, as we have sold out of that size, due to popular demand. This CANVAS GICLEE utilzes Breathing Color's archival "Lyve" canvas, complete with hand-applied protective varnish. Comes signed and numbered by the artist with Certificate of Authenticity. Canvas Editions are limited to 100 pieces worldwide. If you choose to have the canvas gallery wrapped, please allow 2-3 weeks for completion. The canvas will be mailed in a box to your address. Please include your phone number for shipping reference. Please note that international buyers are responsible for any import fees, or taxes. We use heavy duty shipping tubes to ship our items.